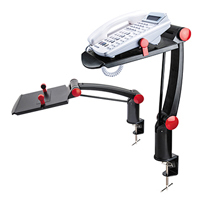 The Ergo Flex Phone Arm offers signficant flexibility by providing an extendable raised platform for your phone which raises your phone up to 16" (40 cm) above the desk (suitable for sit/stand applications). The arm extends 24" (61 cm) and rotates 360°, the platform tilts up to 60° for easy access to your telephone. The platform is 8" x 9.5" (20 cm x 24 cm) and the adjustable spring clip (5" - 9") will fit most phones. There is built-in phone cord management, and the unit can be mounted using a desk clamp. The NewLife Eco-Pro Anti-Fatigue Mats by Lets Gel provide users with the ideal balance of comfort and support for standing applications. The 0.75" thick mats feature a proprietary commercial grade Cellulon Polyurethane Technology which can handle the heavy usage of a workplace environment without losing resiliency (i.e. bottoming out, fatiguing or collapsing over time). The mats are stain and puncture resistant, have anti-microbial properties, and feature eco-friendly construction employing Bio-Foam—a renewable plant based resource. The high degree of cushioning or "bounce" which Eco-Pro mats provide can reduce spinal compression and reduce or prevent discomfort in the feet, legs and lower back. In addition, the movement which the mats encourage can also aid in encouraging flexing of the calf muscles which can result in improved bloodflow in the lower legs. By encouraging users to move and flex their feet throughout the day the mats can reduce the constant stress which joints of the lower limbs are subjected to, spreading the load over a wider area and reducing the potential for stiff and aching joints resulting from inactivity. 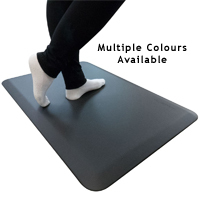 Unlike some "anti-fatigue" mats which are advertised as being suitable for either standing or for sitting on in an office chair - Eco-Pro Anti-Fatigue mats are designed for standing only. The result is that Eco-Pro mats provide a much higher degree of cushioning than those other "hybrid use" mats, providing users with greater comfort throughout the day. NewLife Eco-Pro mats are manufactured in the USA and certified by the National Floor Safety Institute for their high traction no-slip bottom surface. All edges are beveled at 18° which greatly reduces the potential for the mat becoming a tripping hazard. They are available in a variety of sizes to meet the needs of most implementations, and come in Black and Taupe. Users who prefer to work without footwear may find the GelPro Elite Anti-Fatigue Mat a more appealing alternative as it is designed with this type of usage in mind. NewLife Eco-Pro Anti-Fatigue Mats par Lets Gel offre l`utilisateur la balance idéal de confort et support pour les applications debout. Les tapis sont 0.75 po d`épais et compris une technologie exclusif de qualité commerciale de cellulon polyuréthane qui peut gérer l`utilisation intensive d`un environnement de bureau sans perdre sa résilience (tel que s`aplatir ou s`effondrer dans un cours temps). Les tapis sont résistantent aux taches et aux perces, ont des propriétés microbials, et compris la construction respectueuse de l`environnement en utilisant du Bio-Foam- une ressource renouvelable d`origine végétale. Les tapis Eco-Pro sont rembourrés avec un degré élevé ou "bounce" qui peut réduire la compression sur la colonne vertébrale et réduit ou évite l`inconfort des pieds, jambes et le bas du dos. En plus, le mouvement que ces tapis encourage peuvent aussi encourager de tendre les muscles du mollet ce qui peut améliorer la circulation sanguine dans la partie inférieur des jambes. En encourageant l`utilisateur de bouger et de tendre les pieds durant la journée, les tapis peuvent réduire la tension constant que les jointures des membres inférieurs sont exiger d`avoir. En effet, cela disperse le poids sur une plus grande surface et réduit le risque potentiel des jointures qui deviennent rigides et douloureux causer par inactivité. Contrairement à certaine tapis "anti-fatigue" qui sont annoncé à être approprié pour les applications debout et pour applications assis - les tapis d`Eco-Pro Anti-Fatigue mats sont conçu pour debout seulement. Le résultat est que les tapis Eco-Pro offrent du matériaux de rembourrage beaucoup plus élevé que les tapis à double usage, qui offre les utilisateurs un plus grand confort à travers la journée. Les tapis NewLife Eco-Pro mats sont fabriqué dans les États-Unis et certifier par l`Institu national de sécurité de plancher (National Floor Safety Institute) pour leur surfaces de dessous de haut traction et non glissantes. Toutes les bords sont en biseau à 18° et en effet réduit considérablement la potentiel que le tapis soit un risque de trébuchement. Ils sont disponible dans une gamme de tailles pour répondre au besoins de la majorité des applications. Les couleurs sont Noir et Taupe. Les utilisateurs qui préfère travailler sans les souliers vont peut-être trouver que le GelPro Elite Anti-Fatigue Mat est un alternative plus intéressant tel qu`il est créer avec cette application en tête. The Duet Arm Custom Tray from Fox Bay Industries is 12" deep, features a low profile of just 0.375" and is available in widths of 39", 31", 27" and 23". 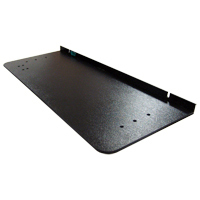 The ABS Plastic tray is fitted with a 1" Keyboard Guard that has convenient cable routing cutouts on both the left and right. It is otherwise free of any obstructions such as raised edges or built-in wrist rests that could increase the risk of injury to the sensitive pressure points on the underside of the wrists. The Duet Arm Custom Trays are predrilled to fit both the Duet Sit-Stand Arm and the Duet Sit-Stand Storable Arm from KV Waterloo. When paired with these arms the Duet Custom Trays provide durable deeper-than-average rigid work surface which can provide support for virtually any combination of keyboard and mousing input device. 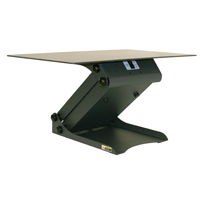 The larger 31" and 39" wide trays can even provide space for additional devices or for notetaking. Note: The Duet Arm Custom Trays are ONLY for use with Duet Arms from KV Waterloo. Mounting holes are pre-drilled for both arm supports as well as the release trigger. Ensure that the arm width matches the width of tray desired. 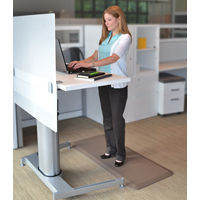 The EcoLast Premium Standing Mat by iMovR is ideal for users who need a balance of comfort and support for standing applications. These 0.75" thick mats feature high-density 100% polyurethane material, which can handle the heavy usage of a workplace environment without losing resiliency (i.e. bottoming out, fatiguing or collapsing over time). This material is stain and puncture resistant, has anti-microbial properties, and is cast in a unibody mold. The high degree of cushioning or "bounce" which EcoLast mats provide can reduce spinal compression and reduce or prevent discomfort in the feet, legs and lower back. In addition, the movement which the mats encourage can also aid in encouraging flexing of the calf muscles which can result in improved bloodflow in the lower legs. By encouraging users to move and flex their feet throughout the day the mats can reduce the constant stress which joints of the lower limbs are subjected to, spreading the load over a wider area and reducing the potential for stiff and aching joints resulting from inactivity. Unlike some "anti-fatigue" mats which are advertised as being suitable for either standing or for sitting on in an office chair - EcoLast mats are designed for standing only. The result is that EcoLast mats provide a much higher degree of cushioning than those other "hybrid use" mats, providing users with greater comfort throughout the day. iMovR EcoLast mats are manufactured in the USA and certified by the National Floor Safety Institute for their high traction no-slip bottom surface. 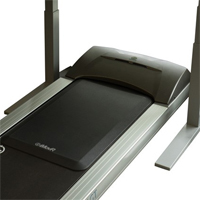 All edges are beveled at 20° which greatly reduces the potential for the mat becoming a tripping hazard. They are available in a 24" by 26" size to meet the needs of most implementations, and come in Black, Burgundy, and Gray (Brown and Tan are special order only). 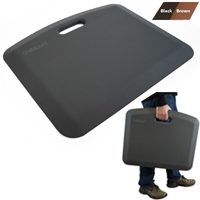 The EcoLast Portable Standing Mat by iMovR has the same top-quality material and features of the EcoLast Premium Standing Mat but also includes the additional feature of portability. These 0.75" thick mats feature high-density 100% polyurethane material, which can handle the heavy usage of a workplace environment without losing resiliency (i.e. bottoming out, fatiguing or collapsing over time). This material is stain and puncture resistant, has anti-microbial properties, and is cast in a unibody mold that includes a built-in handle. iMovR EcoLast mats are manufactured in the USA and certified by the National Floor Safety Institute for their high traction no-slip bottom surface. All edges are beveled at 20° which greatly reduces the potential for the mat becoming a tripping hazard. They are available in a compact 18" by 22" size and come in Black or Brown colour. The EcoLast TreadTop Standing Mat by iMovR has the same top-quality material and features of the EcoLast Premium and Portable Standing Mats but is designed specifically for use on the ThermoTread GT by iMovR. These 0.75" thick mats feature high-density 100% polyurethane material, which can handle the heavy usage of a workplace environment without losing resiliency (i.e. bottoming out, fatiguing or collapsing over time). This material is stain and puncture resistant, has anti-microbial properties, and is cast in a unibody mold. iMovR EcoLast mats are manufactured in the USA and certified by the National Floor Safety Institute for their high traction no-slip bottom surface. All edges are beveled at 20° which greatly reduces the potential for the mat becoming a tripping hazard. They are available in a trim 20" by 32" size and come in Black colour only.